When you have solid BBQ, a return trip is in order. PM BBQ boasted championship chicken, but I got the brisket last time. I want that chicken. What great chicken! Half a bird, well smoked. The skin was barely crispy and peeled back easily, revealing uber-moist and succulent meat. It was well-flavored and the smoke came through wonderfully. My dad got the same thing and we didn’t put a drop of BBQ sauce on it. It was that good. I’ve smoked chicken before with success. It usually turns out really good and everyone likes it, but mine is not this good. The white meat and the dark were evenly moist and tender, and that includes the wings. Every time I cook a chicken on the Weber, the wings get dry. I really don’t know how they did such a great job – this chicken shows great skill. I was told by someone in the know that I made the mistake last time of not getting the sweet corn spoonbread side. It was good, but a little dense. The beans were much better. The slaw was a basic light cream slaw – nothing amazing but not bad. It pairs well with chicken. We also split the small order (that’s a small? does the large come in a bucket?!) of fried pickle chips. I can’t put my finger on it, but it’s a batter I’ve definitely had before. They were a good treat to split. 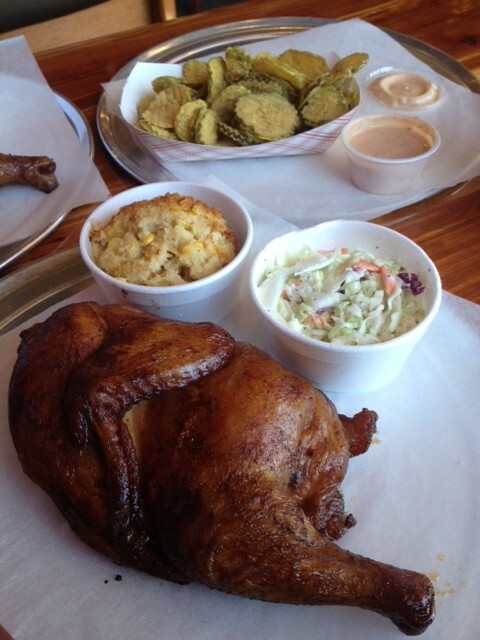 The chicken is worth a return trip, as is the brisket. PM BBQ is a solid BBQ Joint option.